Flipboard is one of the most popular and stylish news readers for mobile devices. It’s also a popular referrer, often at the top of the list of sites sending traffic to many company websites and blogs. While Flipboard provides many of its own personally curated content, users can create their own for private or public viewing. Called Magazines, if they’re public, other users can follow/subscribe which means that your content is right there whenever they open Flipboard. You can also embed a link to your magazine on your website or blog or send/share the link. No one needs a Flipboard account to view your magazine either. Company listings, your blog posts, curated CRE topics (e.g., Retail News), local/area information (you are local specialist, aren’t you?) – the possibilities are endless. Best of all, they’re easy to create and maintain. If you’re not already a Flipboard user, create an account or log into your account from a web browser. I’ve used my personal Flipboard account, so you’ll see that username as the “author.” You may want to create a new Flipboard account for business related magazines. To create your first magazine, it’s easiest to use the desktop version of Flipboard. Go to your profile. If there’s no option to create a New Magazine, go to the Flipboard Tools site and click on “Get the Editor” (or go to https://editor.flipboard.com/). Click on create New Magazine then fill in a title and description. If you’re creating a magazine for marketing purposes, you’ll want to use relevant keywords in both the title and the description. That’s it – your magazine is ready to receive content. You can create multiple magazines and make them public or private. If they’re public, that means Flipboard users looking for specific content could find your magazine and “follow” it. Next you’ll need the bookmarklet installed in your desktop browser. Go to the Flipboard Tools site then click on Get the Bookmarklet. For mobile browsers, first see if there is a Flipboard “share” option to share web pages from your browser. Look under “more…” if you don’t see it and select or turn it on if necessary. Otherwise, go to Tools site from your mobile browser and follow the instructions. Once these are installed start browsing for content using the bookmarklet/share option to “flip” the article (or YouTube video page) to Flipboard. You’ll get to choose the magazine in which you want the content to appear. Note that you’ll need to log in to the desktop version of Flipboard or the mobile app for this to work. It may take a while for you to see the added content (usually closing the Flipboard app and re-opening does the trick) but followers/subscribers should see the updates right away. From your inserted content, Flipboard uses the most recent post for the cover image/story. You can change the cover image by opening the magazine in the desktop Editor, selecting the magazine then clicking the “cover” icon underneath the story/image you want to use. You chosen cover will remain the same until you change it. You can also delete articles or move the order of articles in your magazine (drag and drop) within the Editor. Once you’ve created one magazine in the desktop editor, adding a new Magazine is fairly easy but re-setting the cover is clunky and deleting stories is not possible. Best to stick to the desktop Editor for more control. Left: Sharing options from Mobile browser. 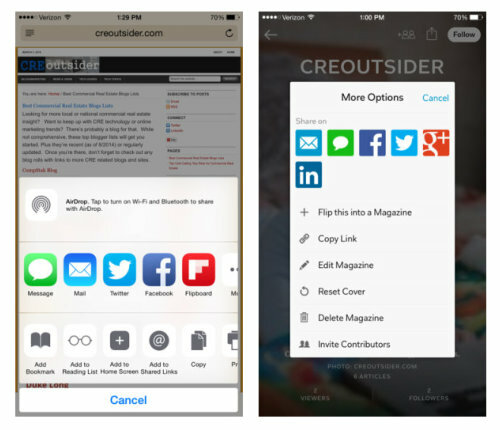 Right: Mobile magazine editing options (accessible from “share” button when viewing magazine in Flipboard app). You can add a “flip it” button to your blog or website (see mine in the right side column), insert a site badge – an enhanced flip it button that adds the link to your Flipboard magazine – or embed the magazine cover on your site (or in a post as I did above). Find Flipboard sharing tools here. Get the URL of your magazine by opening the magazine, then copying the URL from the address bar in your browser. Mine are below. Within the Flipboard Editor you can view analytics for each of your magazines. You’ll be able to see most viewed articles and daily number of viewers and articles. You can flip one magazine you’ve created into another but then you’ll lose the ability to add more content to the flipped magazine. So this feature is best when you want to consolidate or clean up your magazines. Hootsuite users can flip Tweets or Facebook posts to magazines thanks to Flipboard/Hootsuite integration. You can flip content from other channels you’re reading in Flipboard but it’s best to flip from the browser to get the full article and not a snippet. Contributors can be added to any magazine – a great option for spreading the work around. To avoid poor quality/fuzzy images in the desktop Flipboard version (like one of mine is…) avoid resizing your images within WordPress or uploading images below 72 dpi resolution. If you want a permanent cover for a magazine, create a web page with the image and some author/about/contact info, flip it and select that magazine article for the cover. Or, if you have an “about” page with an image, use that. You can also flip a web page with only an image on it but only that image will appear on the magazine page (no text). At this time, there’s no way to automate flipping. Let’s say you wanted to add each new post to your blog magazine – or dump new listings from an RSS feed into one. Flipboard doesn’t offer either option so the only way to add content is using the flip it bookmarklet. But keep an eye out for plugins or integration with apps and social networks to make adding content even easier. Very interesting, Chris – while I’ve always been a fan of Flipboard’s interface (especially since they’ve offered a new, non-native mobile-friendly version), I hadn’t thought of fashioning it into a portfolio showcase tool. I imagine you’re getting some property-specific SEO with it! https://www.pinterest.com/davelewand/website-clients-featured-commercial-real-estate-pr/ … which you’ve now convinced me to duplicate on Flipboard to compare referral success for our clients! That was always my first thought about Pinterest – as a listing “showcase”…though the demo of that network isn’t particularly CRE friendly. For a while, I thought about creating a Pinterest type site for agents/brokerages to pin their listings but figured the discovery issue was too hard to overcome. I have a Google alert set up for another company I work with (not CRE) and notice many of their posts that have been pinned to boards are getting indexed by Google lately. So your Pinterest strategy could pay off… But love the idea of duplicating it on Flipboard – better demographics (50:50 male/female, all ages, 80% college educated, over 50% earn $100K+) and designed mostly for mobile. Think it’s one of the few mobile avenues for CRE marketing.